A heartfelt novel about the disturbing “choking game” trend—and one girl’s struggle for self-acceptance. If she could—if her parents would let her—eighth-grader Windy would change everything about herself. She’d get highlights in her hair, a new wardrobe; she’d wear makeup. But nothing ever changes. The mean girls at school are still mean, and Windy’s best friend Elena is still more interested in making up words than talking about boys. And then one day, Windy gets the change she’s been looking for. New girl Nina—impossibly cool, confident, and not afraid of anyone—starts hanging out with Windy! Nina even wants to be “breath sisters.” Windy isn’t sure what that means, exactly, but she knows she wants to find out. It sounds even better than a BFF. Windy is right, at first. Being a breath sister gains her a whole new set of friends, girls she feels closer to and cooler with than anyone else. But her inclusion in the new crowd comes at a dangerous price. Windy wants to change everything about her life . . . but is she really willing to give up everything in the process? It's summer before eighth grade, and Erica "Chia" Montenegro is feeling so many things that she needs a mood ring to keep track of her emotions. She's happy when she hangs out with her best friends, the Robins. She's jealous that her genius little sister skipped two grades. And she's passionate about the crushes on her Boyfriend Wish list. And when Erica's mom is diagnosed with breast cancer, she feels worried and doesn't know what she can do to help. When her family visits a cuarto de milagros, a miracle room in a famous church, Erica decides to make a promesa to God in exchange for her mom's health. As her mom gets sicker, Erica quickly learns that juggling family, friends, school, and fulfilling a promesa is stressful, but with a little bit of hope and a lot of love, she just might be able to figure it out.Confetti Girl author Diana Lopez returns with this sweet, funny, and utterly honest story about being a girl in a world full of good (and bad) surprises. 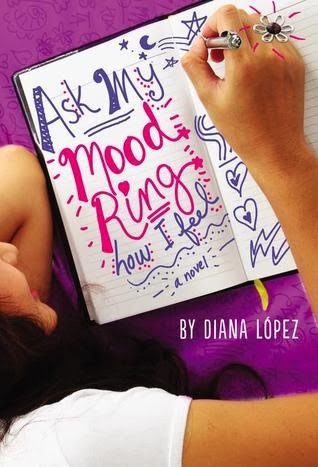 Diana López is the author of the adult novella, Sofia’s Saints and the middle grade novels,Confetti Girl and Ask My Mood Ring How I Feel (to be released in 2013). Her new young adult novel, CHOKE, will be published by Scholastic in July 2012. She is also featured in the anthologies Hecho en Tejas andYou Don't Have a Clue. She has been a guest on NPR’s Latino USA and is the winner of the 2004 Alfredo Cisneros del Moral Award and the 2012William Allen White Award. Diana teaches English and works with the organization, CentroVictoria, at the University of Houston Victoria. the summary of the books look amazing. deal with real life situations and i love that in a book. thanks also for the giveaway.